BlackBerry Messenger (BBM) got off to a rocky start when it made the jump to Android and iOS, but at this point the app appears to be running pretty smoothly. 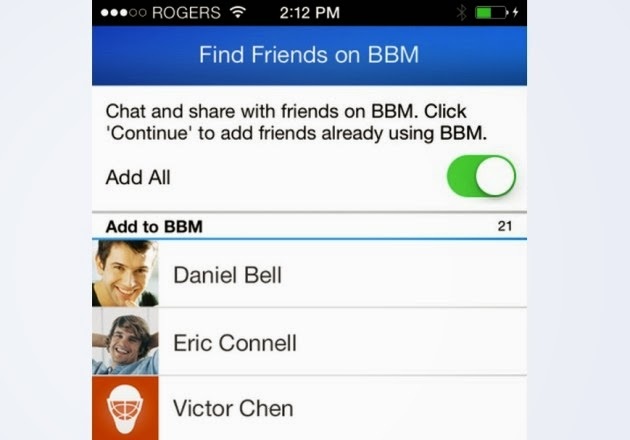 Today, the Canadian company introduced a new “Find Friends” feature to help you add more contacts to your BBM account. The new feature should be available starting today. Once the app has updated, you can use it to scan your phone for any contacts who are already using BBM. You can then send out individual invites to chat or simply add everyone you know with a single tap. And of course, you’ll also be able to invite your friends who aren’t already on BBM to join the service. That alleviates any need to fumble around trying to exchange BBM PINs. With BlackBerry’s smartphone business hanging by a thread, the company’s fondly remembered messaging service may be its best chance to stay relevant. The company hasn’t revealed how many active users the BBM app has been able to grab, but helping current users find and invite their friends should help the service continue to grow.